Is there anything worse than reaching for that frosty glass of lemonade on a warm day, only to find a recently-airborne critter doing the backstroke in your drink? Well, yeah, I can tell you what's worse. Taking a gulp, then realizing there was a swimmer in the pool. A sports bottle or an insulated travel mug with a lid solves the problem when it's just you in the back yard, but when you're hosting a barbecue, maybe you'd like something a little more festive for the mojitos and margaritas. And right now, canning jars are very trendy as drinkware. 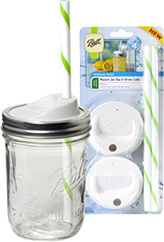 The Ball Sip & Straw lids ($7/4) are one of the latest accessory items from the company that's filling your shelves with canning jars. 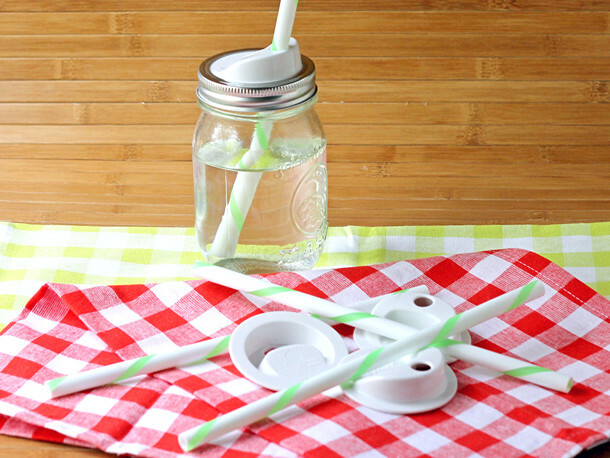 The plastic Sip & Straw lids replace the flat canning jar lid, and you use your own jar rings to secure them. A round hole lets you sip from the container, or you can insert a straw in that hole. After some initial confusion (yes, I'm easily baffled by simple things) I realized that the lids can be used with the bump upwards or the divot downwards. Using a straw, it didn't make any difference which way the lid faced, but there were sipping differences. With the divot downward, it was like sipping from a travel mug, where the bump-up sipping was more like using a sports bottle. There are two sizes of lids - to fit either regular or wide-mouth jars - so you could use that feature to differentiate between alcoholic and non-alcoholic drinks, if that's an issue at your party. Or just choose a lid size to match your canning jar collection.